In February 2016, the former model's favourable rating was a mere 24 per cent, her unfavourable was 31 per cent and 23 per cent had never even heard of her. WASHINGTON: US First Lady Melania Trump's approval rating has soared to double digits since her husband Donald Trump was inaugurated as President on January 20, according to a new poll. The CNN/ORC poll released on Wednesday found that 52 per cent of Americans have a favourable view of Melania Trump, an increase from the 36 per cent pre-inauguration. Now, just 3 per cent say they do not know who the First Lady is, and her unfavorable rate has held steady at 32 per cent, the poll showed. 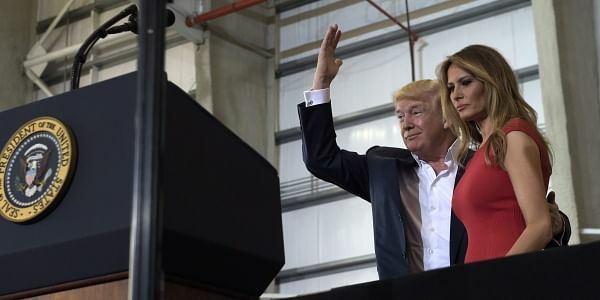 The results fall along party lines; 86 per cent of Republicans view the First Lady favourably, while just 22 per cent of Democrats feel the same. The margin is a lot wider for her Melania Trump than it was for her predecessor Michelle Obama, who in April 2009 had a favourable rating of 93 per cent among Democrats and 50 per cent among Republicans. According to the poll, men have a more favourable view of her than women. Fifty-eight per cent of men view her positively, and 46 per cent of women. Michelle Obama's numbers in that category were dramatically flip-flopped with 78 per cent women and 68 per cent men. Interviews for the CNN/ORC poll were conducted from March 1 to 4, by telephone with 1,025 adult Americans.